“Visions and Voices” marks the halfway point of Star Wars Rebels’ somewhat rocky third season. The first season of Rebels had its own problems finding its footing, but by the back half with its focus on character development, be it Ezra’s training to become a Jedi or simply offering a strong episode that smashed the Bechdel Test (“Out of Darkness”), it finished strong. Part of that was helped by the emergence at the end of Grand Moff Tarkin, who literally did away with the incompetent Imperial leadership on Lothal and provided a show where the stakes for our rebels grew more serious. Season Two so far remains the strongest of the two and a half seasons so far, benefiting immensely from the limited but poignant use of Darth Vader and Ahsoka Tano. However, it’s true strength lay in the numerous episodes it dedicated to our characters’ development, from “Wings of the Masters” to “The Honorable Ones.” Every member of the Ghost’s crew were offered episodes that delved into who they were, even when those episodes were not necessarily critical to the overarching storylines of the season. The same, unfortunately, isn’t as true for Season Three. Season Three began with the news that longtime Supervising Director, Dave Filoni, had been promoted to Executive Producer, which signified that Filoni was stepping back somewhat in the degree of his day to day work on the show. Justin Ridge, a long time collaborator of Filoni’s, was promoted to Filoni’s old position, but it’s hard to say how or what the real difference has been given the lead time in producing episodes for the show. 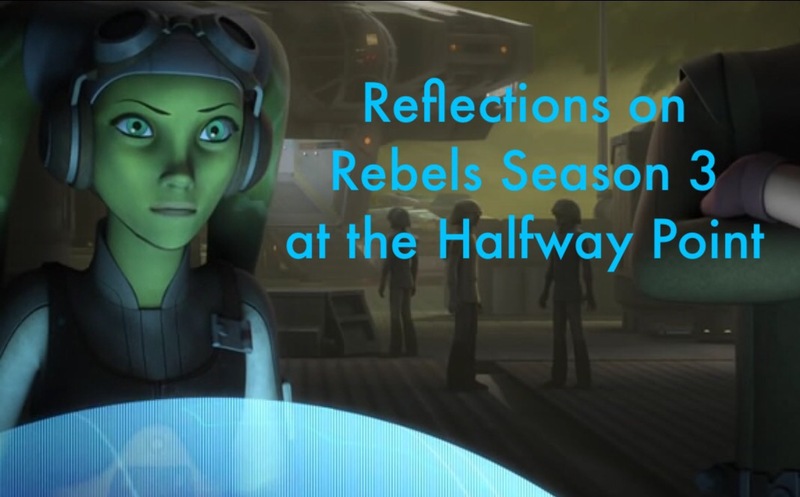 What can be differentiated between Season Three and Season Two are much reduced emphasis, at least on the front end, regarding real character development for the show’s rebels. There have been ten episodes, but genuinely only two or three of those episodes have really offered much if anything regarding our heroes. Perhaps Season Three pales against a superior run in Season Two, which also hid Darth Vader from view for most of a season, but it filled that gap with the aforementioned character episodes where fans could watch, enjoy, and forget that the Lord of the Sith was not present. Likewise, the show introduced more Inquisitors to provide a challenge to our protagonists that was balanced by Imperial challenges to the nascent rebel movement. That balance simply is not present in the current season and can be spotted when we ask ourselves, what has changed or not changed regarding our characters. Beyond “Steps into Shadow” and “The Holocrons of Fate,” Kanan Jarrus has remained static. 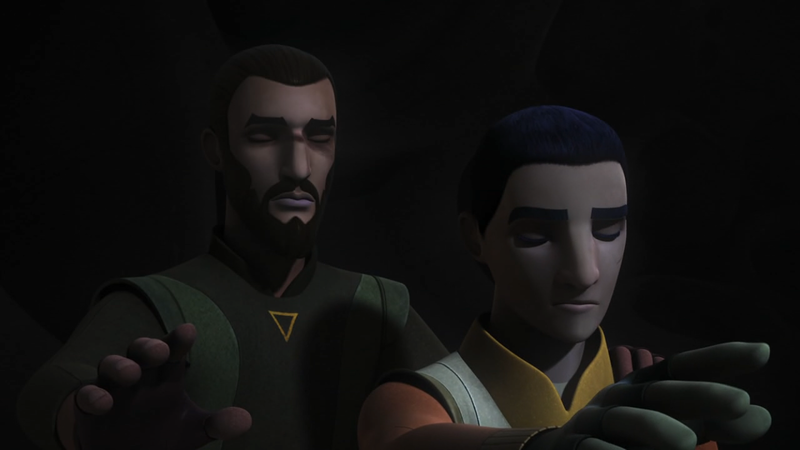 He has learned nothing new about himself or the role of being a teacher to Ezra, and we haven’t even been provided any instances of Kanan teaching his padawan, which occurred regularly in the first two seasons. Ezra, likewise, began with a fantastic flirtation with the Dark Side in “Steps into Shadow,” but by the conclusion of that episode had seemingly put that danger behind him and has ever since remained static. Even “The Wynkahthu Job,” nominally designed to teach Ezra that his trust in Hondo was somewhat misguided, barely conveyed a transition from trust to comedic skepticism of Hondo’s self-dealing nature. Sabine Wren has had a number of episodes in which she’s been featured, but to a minor alarming degree, also overlooked. “The Antilles Extraction,” should have been a great episode to learn more about Sabine’s past at the Imperial academy on Mandalore, on what helped motivate her to leave and inflict dishonor on her clan. Instead, it turned more into an episode about Wedge Antilles and his decision to leave the Empire, when it easily could have done both. Likewise, in “Imperial Supercommandos,” an episode that heavily drew upon Sabine’s culture, it felt much more like a setup for a future episode and turned the attention of character development to Fenn Rau over his fellow Mandalorian. There is little, if anything, one can say to have learned about Sabine that was not explored previously with more dedication. Even less can be said about Zeb, who had both “Legends of the Lasat” and the incredible “The Honorable Ones,” last season. This season, Zeb has had one episode so far and in the vein of “Fighter Flight,” without the purpose of that episode to bring him and Ezra closer as friends. 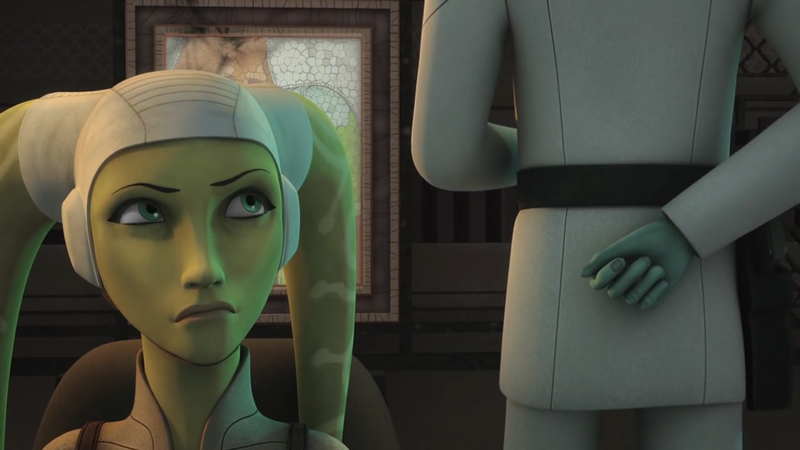 This leaves Hera Syndulla as the remaining member of the crew. This is not to forget Agent Kallus, who was revealed to be the newest traitor to the Empire in “An Inside Man,” an episode that also highlighted Thrawn’s abilities and brutally efficient approaches to solving problems. Arguably, “An Inside Man,” and “Visions and Voices,” the last two episodes of the first half are solid productions and more in line with the routine of Season Two. Part of the problem may be simply too much an interest in pulling in new characters, such as the kids of Iron Squadron, or spending an episode focused on bickering between Hondo Ohnaka and Azmorigan. Rebels has shown it can do this successfully in the past, but virtually every time it has done so this season so far, the major characters suffer as a result. The good news is that part of the problem with the first half may be because it has been unfortunately sacrificed as the setup for the second half of the season. 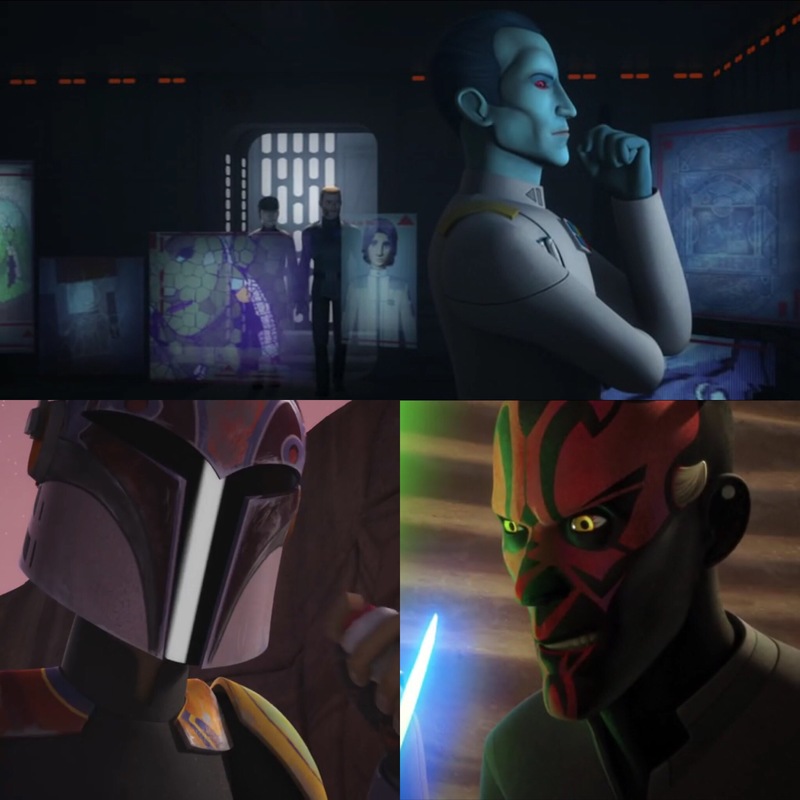 A number of interesting storylines have been promised to come to fruition in the remaining ten episodes, such as the resolution of Maul’s role in the show. From all appearances, Rebels looks like it’s going down the path of “Old Wounds,” a one-shot story about Maul hunting down and trying to exact his final revenge on Obi-Wan Kenobi in the sands of Tatooine. In that story, Maul ends up dead. Maul’s path this season could have the same ending. Likewise, there’s plenty of evidence that Thrawn will spring a trap intended to wipe out the majority of Phoenix Squadron, something that would happen not in the finale, but very close to it. As an extension of Thrawn’s storyline, there’s also the danger wrapped around Thrawn’s promise to uncover the identity of Fulcrum, which promises to bring together the show’s two most interesting Imperials. Finally, thanks to “Imperial Supercommandos” and Sabine’s acquiring of the darksaber in “Visions and Voices,” it’s almost a given that the rebels will head to Mandalore or at least a great number of Mandalorians. All three of these storylines could definitely have great potential for exploring characters and offering riproaring good television unfold. 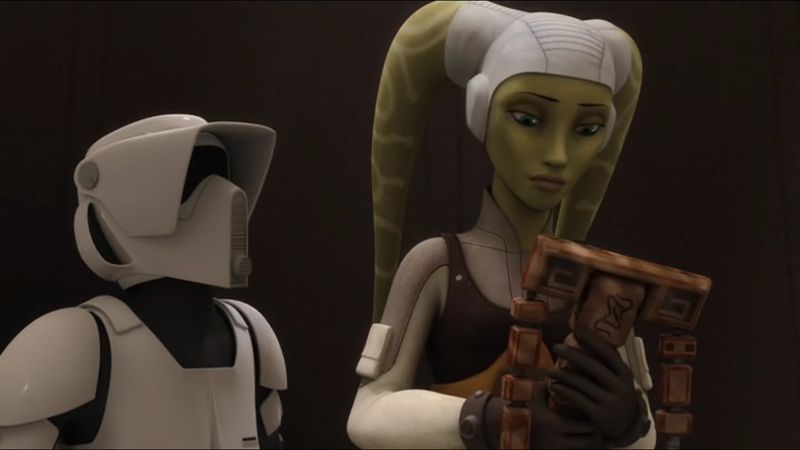 Season Three, as it is now, has the ability to right its ship and finish in the same strong manner that Rebels’ first season did. In fact, given just the storylines mentioned above, it feels as if it may be impossible short a failure to execute to not have that incredible conclusory second half. One area the season has done fine with has been its animation, scoring, and voice acting, which have all been superb. Even when Season Three has been a little disappointing, it has done so beautifully packaged. Hopefully, everything that Rebels is already doing well this season will be supported by what we know Rebels can do well, storytelling and character development. Season Two ended with a masterpiece of a finale that left everyone breathless for the return of the show; let’s expect this season to do the same.